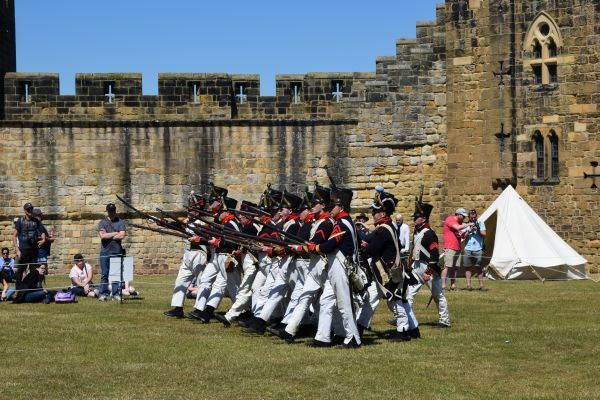 History is brought to life with this incredible live firing display and drill re- enactment, inspired by the British Army’s renowned 68th Durham Light Infantry regiment. Between each firing performance you can observe costumed infantry and their numerous weapons, all within their ‘living history’ encampment. View the unusual uniform adopted by this regiment, from a cylindrical head-dress to the intensely coloured redcoat. Hear harrowing tales of heroism and valour, as well as learning the historical context which led to the formation of the Durham Light Infantry and the subsequent expeditions and wars they were involved in across the globe. Established in 1975, this re-enactment troupe attains the highest levels of historical accuracy and interpretation through quality research and use of replicas. Why not come and join the Durham Light Infantry this May Bank Holiday weekend, between the 4th and 6th of May, and witness some history in action! These superb firing displays and drill re-enactments are free with admission to Alnwick Castle! Please check the ‘What’s On’ board upon arrival for show timings and locations, as these can vary throughout the season.